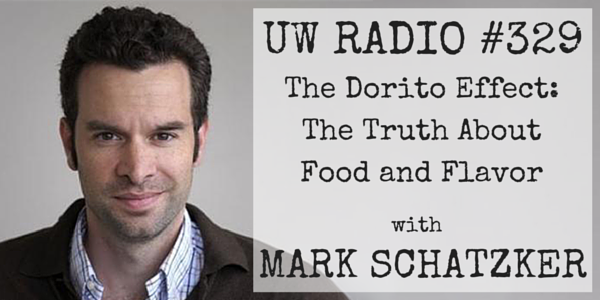 Mark Schatzker, award-winning food journalist and author of The Dorito Effect, reveals the surprising truth about food and flavor. Topics include why artificial flavoring may be a missing piece of the obesity puzzle, the satiating benefits of natural food toxins, and why you may have no idea what a real chicken tastes like. 3:31 – The most important word in our food world and how a family vacation changed the world of flavor, allowing us to make food taste anyway we it want it to. 6:39 – Why do we use so much flavor? The technology of food and the reason most strawberries taste like cardboard. 8:14 – How a simple “Chicken of Tomorrow Contest” got us moving in the wrong direction of cheaper, faster, diluted chickens and vegetables. 16:27 – Food crisis or flavor disorder? A new look at obesity and why we’re eating more than we ever have before. 22:11 – Why does food even have flavor in the first place? What your DNA has to do with flavor and nutrition and how your body knows what’s in food before you even eat it. 24:12 – The realities of flavor, cravings and food addiction: how fake flavor sells us a promise it can’t deliver. 25:56 – The joke of “natural” flavor, the antioxidant that might actually be making your real food taste good, and why you should always take a look at that ingredient list —even if it’s a “health” food. 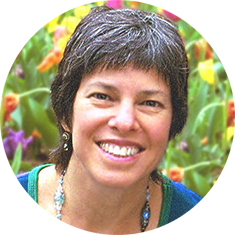 33:12 – What the amazing nutritional wisdom of animals and humans can teach us about eating food that gives us what we need and what goes wrong when you throw fake flavorings into the mix (plus what you can do to fix it)! 44:58 – Is there enough real food to go around? The tradeoff between quality and quantity in our food supply. 47:22 – Are toxins in our food really that big of a deal? 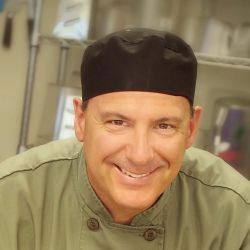 Mark’s take on chemicals and toxins in foods we are consuming and why we can so easily overeat refined processed foods. 52:06 – The best evidence that we’re getting the obesity problem wrong and how you can use bitter foods to increase satiety. 57:31 – Some helpful info for finding real chickens. #327 – Ex-Pharma Sales Rep Tells All. Gerald Roliz — author of The Pharmaceutical Myth — pulls back the curtain on the pharmaceutical sales industry, revealing how he was trained to use fear, pressure, and gifts to “buy out” doctors who would prescribe the medications he represented. Plus, what made him walk away from it all to help people heal naturally. 2:00 – How dreams of becoming a doctor led Gerald to a company car and unlimited expense account as a pharma rep.
6:30 – Selling pharmaceuticals: how the industry teaches drug reps to spin side effects for better sales. 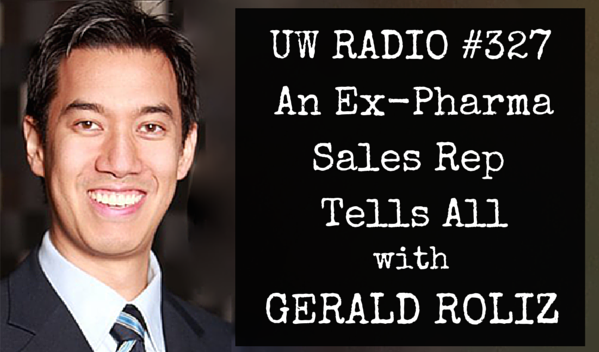 15:04 – How doctors are being bought out and why the pharma industry gets away with calling bribes “gifts.” Plus, the one “gift” that makes Gerald want to throw up on UW Radio! 17:55 – Have you seen a Pharma rep in your doc’s office? What this could mean and why you should start asking questions about it! 22:59 – More marketing tools and tricks used by the Pharma industry to keep close contact with doctors…and why there isn’t much your doc can do about it. 26:16 – Doctor-induced diseases or drug side-effects? What the difference is and how patients can reduce prescription drug use to avoid both. 32:22 – Gerald’s personal experience with “biochemical weapons” as treatment that powers his current passion for health. 38:20 – The $600 dinner that changed Gerald’s mind about pharmaceutical sales and how he finally forced him to plan his exit from the industry. 44:54 – The 3 major risks of medications and the best ways to support yourself or loved ones to become drug-free. 49:43 – The impact of our health habits on generations to come and what we can do to move closer to experiencing optimal health. #326 – How to Make New Habits Stick! Gretchen Rubin, bestselling author of The Happiness Project and Better than Before, reveals 8 effective strategies for creating new habits and how to exploit your own personality type to make your habits stick. 2:21 – Why do we do what we do, why are we the way that we are? 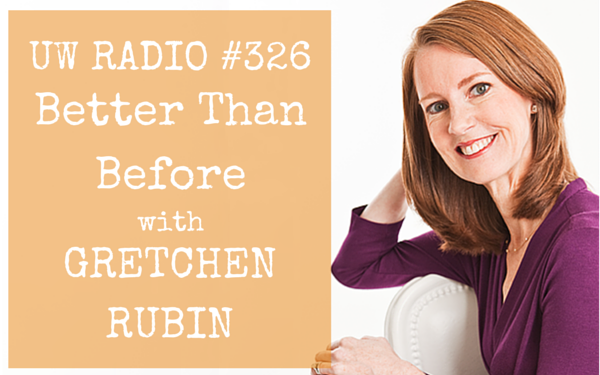 How Gretchen got into the business of happiness and habits. 4:05 – The puzzle of habits: Why sometimes we can change and sometimes we can’t – even if we want to. 6:05 – When it comes to habits and expectations, there are only four types of people. Which type are you? 8:40 – Can people change? How to bust through the limitations of your habit tendencies to live more consistently with your nature. 12:04 – The 4 foundational things you need to get a handle on to master your good habits and eliminate the need for willpower. 14:42 – The importance of getting control over (or getting rid of!) the “stuff” in your life. 17:58 – Should you be monitoring your habits? The benefit of knowing where you are at all times and who this strategy might work for. 24:34 – Why going public with your goals could be good for you – and why some people should keep it secret. 25:58 – The danger of YOLO and the vicious start/stop cycle and how you can reframe habit stops and backslides for major success. 29:29 – The all-powerful lightning bolt: how people and habits really CAN change overnight! 32:54 – Abstainers vs. moderators. Why some people need it to be “all or nothing” and how it out could make all your cravings disappear. 39:33 – Are rewards and values undermining your habits? How to set up rewards to make your habits stronger…and when it’s OK to admit that you don’t even want to try. Dr. Chip Lavie, author of The Obesity Paradox, reveals why thinner can mean sicker and heavier can mean healthier. Find out why being oveweight or obese on the BMI scale can protect those with heart disease, diabetes, HIV, arthritis, cancer, and more. You’ll also learn what REALLY matter when it comes to longevity. And why endurance training can actually shorten your lifespan. 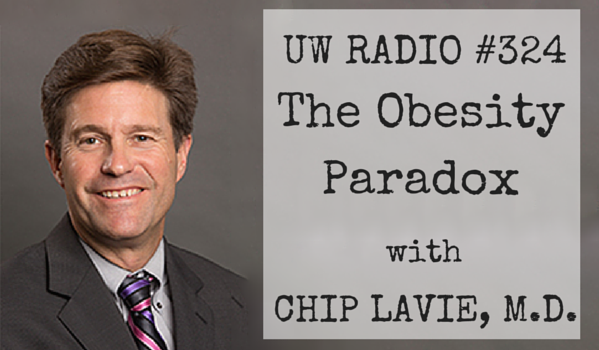 2:26 – How Dr. Lavie discovered The Obesity Paradox almost by mistake. Do overweight, obese or people of normal weight have the better prognosis? 8:29 – Death by weight: What a huge study of 2.9 million people showed us about weight and mild obesity. 10:42 – Are the obese doing really well or is everyone else just really bad? The connection between your BMI, body fat percentage and muscle mass. 16:24 – Some surprising stats bust through common myths about weight and disease and what it means to be “metabolically healthy” regardless of how much you weigh. 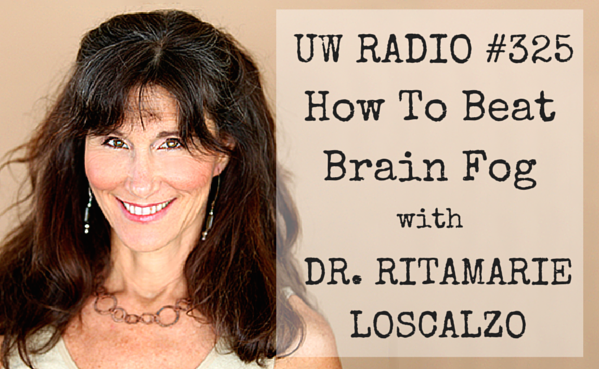 19:32 – Calories in vs. calories out: a different take from Dr. Lavie and where/when he thinks we’ve gone wrong. 24:00 – What fitness really means when it comes to the obesity paradox and why a little extra weight does not equal doomsday. 32:15 – FIT vs. FAT. Which one always wins the fight for your health and why. 35:39 – “Fit” isn’t as hard as it sounds: the best ways to move (and eat) to maximize long-term benefits. 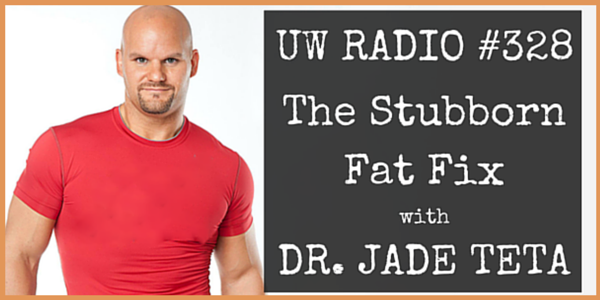 42:33 – The future of fat: Will we ever be able to accept it? 44:46 – The obesity overlap and why it is so hard to prove whether or not it is a disease or just guilty by association. 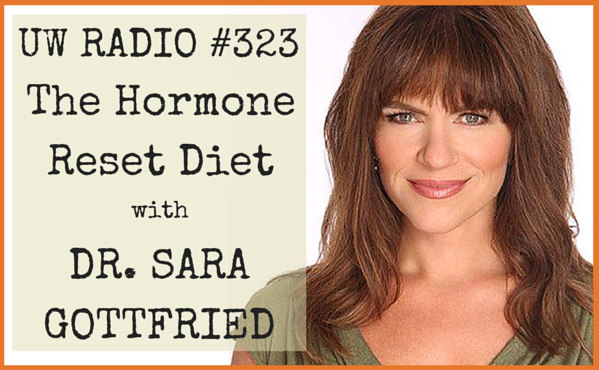 Dr. Sara Gottfried, author of The Hormone Reset Diet, returned to the podcast to reveal how you can balance your hormones and heal your metabolism through diet and lifestyle changes. 3:01 – Cravings for Grandma’s chocolate chip cookie dough turned into disordered eating as a teen … and maybe set Dr. Sara up for adult hormone challenges. 8:25 – Are women expected to be everything to everyone all the time? How society’s expectations of women could be leading to addictive behaviors. 10:58 – Madonna helps Dr. Sara dump out her body image shame bucket and find clarity to make a change – and teach other women how to do it too. 13:57 – Why is alternative medicine the 2nd class citizen? The hierarchy of medicine and the reason there isn’t better nutrition science. 18:11 – How modern meat could be making your breasts and hips bigger than they should be … and what you can do to “poop out” some extra estrogen. 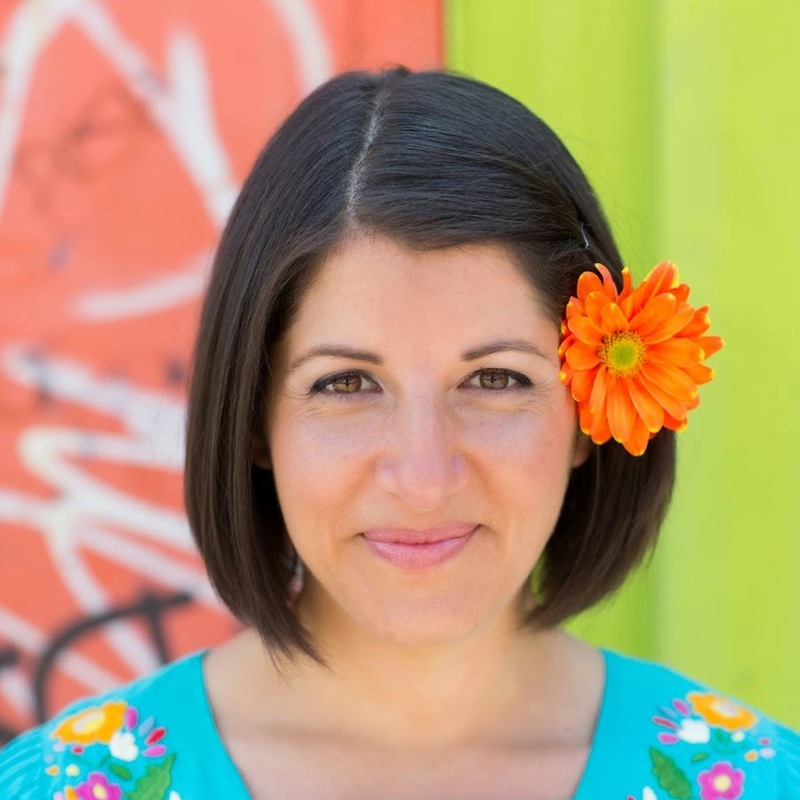 40:32 – Dr. Sara’s favorite supplements ever for balancing hormones and blood sugar. 42:01 – What fat-free potato chips have to do with reducing your toxic load … and why you probably shouldn’t eat them anyways. 47:38 – Get your free Hormone Reset Cookbook!